This colorized scanning electron micrograph shows human cells in a lab infected with “pink” influenza viruses. As many as 650,000 people each year die from flu, according to the World Health Organization. 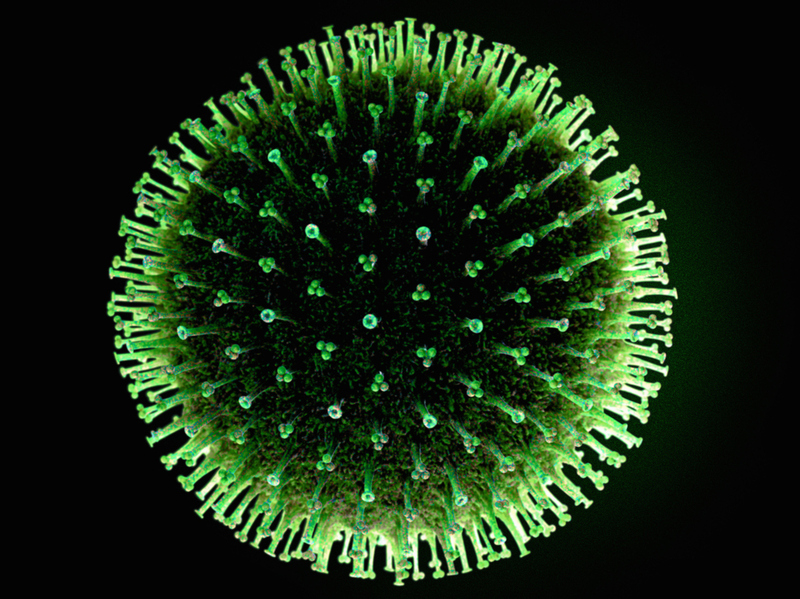 Compared to most disease-causing viruses, influenza is a particularly hard nut to crack. A two-dose vaccine in childhood protects you from measles for life. Smallpox is similarly preventable with a single vaccine. But to evade the flu virus, we need a different vaccine each year which, even at its most effective, can fail to protect against all strains of the virus. While the measles virus of your childhood is essentially identical to the strains circulating today, influenza is constantly changing. Its outer protein layer, which our immune system uses to identify and neutralize the virus, evolves rapidly to avoid detection. Influenza’s shifty nature has thwarted scientists’ efforts to develop a vaccine that could be administered once, or rarely, and provide long-lasting protection against most or all strains. Antiviral drugs like Tamiflu, administered post-infection, can be effective, but some quickly shifting strains soon become resistant to the drugs. Research published Thursday in Science details the early development of what might eventually become a drug that’s more broadly effective. It’s designed to target areas of the influenza virus that hold constant from strain to strain. The influenza virus. The small-molecule candidate drug described in Science this week binds to the “stalks” of the proteins studding the virus’ outer coat; in still-early experiments that seems to prevent the virus from infiltrating cells of the human lung. When taken orally by mice before exposure to flu, the experimental treatment — a small molecule designed to mimic the sort of microbe-fighting antibodies vaccines provoke — provided 100 percent protection against many different strains of the virus, and neutralized infection in lab-grown cultures of human lung-tissue cells. While human use of this drug is still years and many layers of testing away, the research opens a fruitful direction for future experiments, according to Jesse Bloom, a virologist at the Fred Hutchinson Cancer Research Center and a Howard Hughes Medical Institute investigator, who was not involved in the study. The novel approach takes a page from the success, and biology, of vaccines. Vaccines work by cluing our innate immune systems in to what disease-causing viruses look like. With this biological information, our bodies produce specific antibodies that can be deployed against the viruses before they can wreak havoc. About a decade ago, scientists discovered “broadly neutralizing antibodies” that target a sophisticated part of the influenza virus — a part that helps it pry open our cell membranes and infiltrate the cell. Researchers were excited to find that this mechanism seems to be the same from flu strain to flu strain, allowing the same antibodies to work against most infections. “The field got excited about using these to potentially design more universal vaccines,” says Ian Wilson, a structural biologist at the Scripps Research Institute who co-authored the study. While research continues in that vein, Wilson and his colleagues went a different direction. They wanted to leverage the biological information contained in these antibodies to design better flu treatments — not just a vaccine. Currently the best drug treatment for influenza infection is Tamiflu, which works by preventing the virus from replicating in our bodies. Tamiflu does help lessen the severity of flu symptoms, according to the CDC, but must be taken relatively soon after infection. Further, some cases of resistance to the drug have popped up. “In fighting a rapidly evolving virus like influenza, it helps to have many arrows in your quiver,” says Bloom. Theoretically, in a patient very sick with the flu, a doctor could inject a broadly neutralizing antibody and let these proteins do their magic, quelling the virus. In practice however, this proves difficult. Antibodies are large, complex, and relatively fragile molecules, according the researchers, and that makes them difficult and expensive to produce and administer on a large scale. Maria van Dongen, a scientist at Janssen Research & Development, and her colleagues wanted to design a smaller molecule, or drug, that mimics the action of broadly neutralizing antibodies. Such drugs would be cheaper to produce, easier to store, and could be taken orally. The researchers used precise knowledge of the structure of broadly neutralizing antibodies and the “stalk-sites” on the flu virus to which they bind to screen about 500,000 different small molecule configurations, homing in on the closest antibody mimics. One particular class of molecules, benzylpiperazines, stood out, and they further tweaked it to optimize interaction with the antibody binding site on the virus. They next tested their drug candidate for efficacy in mice infected with what would normally be lethal levels of influenza. All mice treated with the small molecule survived. The drug was similarly effective in eliminating the virus from human lung cells grown in the lab. If the candidate drug clears those many hurdles — still a big if — it could provide a powerful flu treatment that targets an earlier stage of infection than Tamiflu, the scientists say. Bloom says we need more such broadly acting drugs if we’re going outsmart a virus that kills as many as 650,000 people worldwide each year and sickens millions more. He’s aiming to bring down those numbers.